If uber are acting like this now, how would they act if they had a monopoly? During its ascension to ride-hail market supremacy, the company developed and stress-tested an effective playbook for entering even the toughest of markets. A combination of clashing with local governments, grassroots activism, and lobbying, it brought Uber success in cities like Portland, Oregon, which vehemently opposed it. Uber brought that blueprint to bear on Vegas as well. It entered the market without permission; it called on locals to sign a petition to the governor; it hired more than a dozen of the best lobbyists in the state to make its case. On the morning of Oc. 24, Uber launched its UberX service in Las Vegas — apparently without permission to do so. The company didn’t have the required business license from Clark County, nor had it applied for one. Uber claims that it didn’t think it needed to. But entering a market before it’s legal and asking for forgiveness rather than permission is a standard marker of the Uber playbook. Asked at a Nov. 25 hearing why it didn’t resolve any regulatory issues before operating, company attorney Don Campbell said to a District Court judge, “Because we don’t believe the statutes apply.” The company has long maintained that it’s a technology platform, not a transportation service; why should it need the common carrier license all taxi and limo companies require? 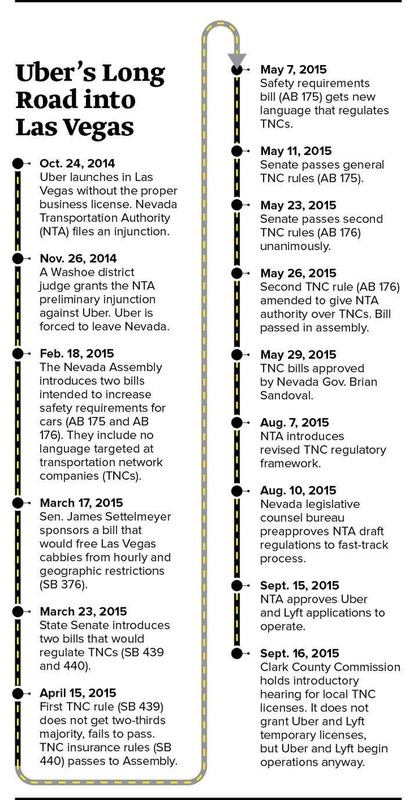 Astonishingly, in under two weeks, Uber and Lyft drivers have been cited 87 times by local police for “taking fares to and from McCarran International Airport without the business licenses to do so”. It’s this wilful disregard for regulatory structures, something which clearly pervades the company from top to bottom, which fascinates me about Uber (and to a lesser extent Lyft). Their emerging playbook for breaking into markets, as well as the sheer aggression they show when doing so, promises fireworks as they continue to enact their planned pivot into a global just-in-time logistics operation.